There's a new treasure hunt of sorts in GTA Online this week, so here's how to get that stone hatchet and some free GTA money. Following GTA Online's treasure hunt where you could unlock a Red Dead Redemption 2 revolver, you can now unlock a stone hatchet from Rockstar's upcoming Western. Unfortunately, while console users can unlock the same weapon in Red Dead Redemption 2 at the same time, you can only use it in GTA Online, since Red Dead hasn't been announced for PC. 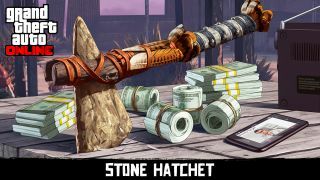 But it's worth getting, just to try out this brutal melee weapon's new rampage mode, and to bag yourself an additional $250,000 of in-game cash. Here's how you do it. A little while after you sign into GTA Online, you'll get a text message from a new contact called Maude Eccles, who you might remember from GTA 5. She'll give you bounty missions that involve tracking down NPCs across the map. These are pretty straightforward, and take you to a variety of places. I had a couple in the same town in Blaine County, and a few towards the city, mostly in smaller locations where there was a store or a gas station. Maude will send you a picture of each target, and a highlighted area of the map that denotes the target's last known location. You likely won't need to look at the picture more than once, because the game points out who the target is when you get close enough. They're never far from the sidewalk, and just driving around a little will show you where they are. This target was a bit harder to find, because she was hiding in a bus stop. Usually they're just lingering at roadsides. When you find a target, you can kill them, but making them surrender provides an extra reward. They'll start trying to perform melee attacks on you, but just a single bullet will make them surrender. At this point, the target will follow you, so get back in your vehicle and drive them back to Maude. Each bounty bags you a $10,000 reward. Maude will contact you very soon after with another target. I did the whole thing in about an hour. Perform five of these bounty missions, and the quest strand will end. Maude, though, will inform you that your final target had a stash, and gives you the location as an additional reward. You'll be given a map marker that takes you to a house where there's a chest containing the stone hatchet. Enjoy your free $250,000 and deadly new weapon, which has some truly nasty kill animations. The only price...was time. If you're looking to make more cash in GTA Online, check out our guide on how to do that. Don't miss our list of GTA 5 cheats, either.